(Reuters) - Monsanto Co, the world's largest seed company, reported higher-than-expected quarterly earnings on Wednesday as its corn and soybean businesses expanded globally. The company, which specializes in developing genetically engineered crops that withstand herbicides and ward off insects, said the profit margin in corn, its top revenue producer, increased 2.5 points in the second quarter ended on February 28. The corn business was on track to post record volume for the fiscal year, despite lower plantings expected in the United States this spring. Growing market opportunities in Eastern Europe and advancements in Latin America are helping the company's corn business. And despite year-to-year fluctuations in output and demand, Monsanto said it sees demand for corn worldwide surging with population and income growth over the next several years. "This is a year where everyone in agriculture recognizes the market realities of softer commodity prices, more volatile global currencies and some decrease in corn acres in key markets like the Americas," Monsanto Chairman Hugh Grant said on a conference call with analysts and reporters. "We're not immune to these trends," he said. "But our business is on track to deliver the growth we anticipated." Still, reaction was mixed, and the stock seesawed. Analysts said there were both positive and negatives with the quarterly performance, including weaker-than-expected growth in herbicide earnings. And some investors were disappointed that the company did not raise its outlook, citing expectations for flat results this quarter. "Lots of puts and takes this quarter," said BGS Financial analyst Mark Gulley. "A standoff thus far." Shares of Monsanto were up 1.4 percent at $115.17 in afternoon trading after falling 2 percent earlier in the session. Monsanto said it had earned $1.67 billion, or $3.15 a share, in the second quarter, up 13 percent from $1.48 billion, or $2.74 a share, a year earlier. Analysts on average were expecting $3.07 a share, according to Thomson Reuters I/B/E/S. Net sales rose to $5.8 billion from $5.5 billion, in line with analysts' expectations. Corn remained the key driver despite lower commodity prices and expectations by the U.S. Department of Agriculture of plantings on 91.7 million acres in 2014, the smallest area since 2010. After a nearly 40 percent drop in corn prices since last summer, U.S. farmers are expected to switch some of their acreage to soybeans. Monsanto said its corn portfolio was expanding globally, helping sales of corn seed and traits rise 4 percent to $3.4 billion in the quarter. And executives said Wednesday that they saw opportunities for net sales growth of $1 billion in that business in the next five years due to global demand. 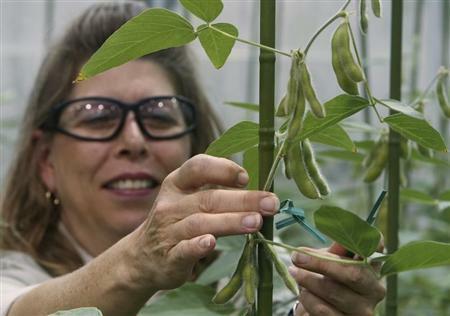 Also strong, sales of soybean seeds and traits rose 21 percent to a record $820 million. Monsanto is undertaking its largest-ever soybean product launch now, rolling out offerings in Latin America that combine tolerance to glyphosate herbicide, protection against caterpillars and yield improvement. The company also sees a $1 billion net sales growth opportunity across five years for soy, executives said. Sales of vegetable seeds rose 10 percent to $219 million, while sales of cotton fell 18 percent to $49 million. Overall, sales in Monsanto's seeds and genomics segment totaled $4.6 billion in the quarter, up almost 7 percent from a year earlier. The company's agricultural productivity segment, which includes the Roundup herbicide business, contributed $1.2 billion, up from $1.1 billion. The company said it still expected full-year earnings per share of $5.00 to $5.20 on an ongoing basis and $5.02 to $5.22 on a net basis.